Find your place in the PACK OF DORKS with this quiz! Are you a Lucy, a Sam, a Sheldon, an Amanda or an April? Maybe you're even a Shemanda! A Blind Guide to Normal! 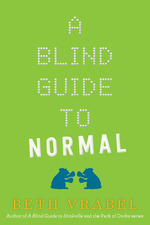 I couldn't be more excited to share that A BLIND GUIDE TO NORMAL is on bookshelves now! I hope you'll love Richie Ryder Raymond as much as me! JASPER THE DOG IS FAMOUS! April 11-13 at South Eastern Intermediate School in Fawn Grove, Pa. I had a blast meeting students in this district in October and am delighted to have been invited back for a three-day workshop! I'll be meeting with fifth- and sixth-graders to focus on writing with authenticity. 1-3 p.m. April 16 at Sarah's Creamery in Dover, Pa. What's better than having your own copies of PACK OF DORKS and A BLIND GUIDE TO STINKVILLE signed by the author? Having your books signed while eating delicious Penn State ice cream! Mmmm! While we're in the area, we'll also be stopping by The Wolf Sanctuary in Lititz, one of my favorite places on Earth. Have you ever been there? Please go. It's a beautiful place. Also, watch for details soon about a book signing in May at Barnes & Noble in Canton, CT, to celebrate the release of CAMP DORK! I love this new adventure with Lucy and her pack and know you will, too! I'm thrilled to also share that I'll be leading a summer writing camp 1:30-3 p.m. June 27 to July 1 at Avon Free Public Library in Avon, CT. Campers will dig deep to find their own stories, reimagine them, and write from the heart. When registration opens, I'll share more details. In August, I'll be visiting Dover Area Community Library in Dover, Pa., (the same library where the littlest Vrabels attended storytime! *waves a shaky egg to Miss Ellen*) as part of its summer reading program. Each summer month, young readers are invited to take part in a giant book club. The library provides copies of a book, they discuss the books together, and finally readers meet the author at a pizza party. The library calls it Free Books, Free Food and Famous Authors! *blushes* I'll share more details about this soon. And, to go a bit further into the future, A BLIND GUIDE TO NORMAL releases in October! Squee! This book, friends. I am so excited for you to meet Richie Ryder Raymond! I'll be celebrating with readers in Missouri! I plan to visit readers in Warrensburg, Jefferson City and Moberly in early October. Last but definitely not least, I'm going to be meeting with Canton, CT, students in January as a visiting author to Canton Intermediate School. Woot-woot! Want me to visit your school, bookstore or library? Here's how! Enter to win an advance reader copy of CAMP DORK! Lucy and her Pack's next adventure doesn't hit bookstores until May, but you can get a sneak peek with this Goodreads giveaway! Good luck! An Interview with The Qwillery! Check out this awesome interview with The Qwillery! 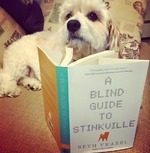 A BLIND GUIDE TO STINKVILLE is a month old! Woot woot! To celebrate, I'm giving away an Audible copy of the book. When I first heard that STINKVILLE would be released on audio, I was so excited! This is a perfect venue for visually impaired readers to enjoy the story. When Audible offered me several complementary copies, I began making arrangements to give copies to a few local children with blindness or low vision. I'd also like to give a copy away here on my blog to anyone who is interested! Let me tell you, it's amazing to hear Alice's story come alive. The narration is wonderful! Do you listen to audio books? If you haven't, please give it a shot. My family listens to audio books during road trips. This summer, WONDER made a trek to the White Mountains of New Hampshire fly by. Entering is easy! Hope you win! Only a few months separated Matthew Potter and his siblings, but he knew it was his job to protect them. They believe he still does. Weeks before his sister’s birthday, he begged to buy her a teddy bear he spotted at a shop. “I want to get it for her now,” he said when his mom told him to wait. Days before he died, he ran from the playground and his mommy panicked. “I’m okay. Even when you can’t see me,” he told her. That morning was clear and bright. A perfect day at the fair. This is the last photo the Potters have of their son Matthew. He was a happy boy. He was mischievous but always kind. The day after Matthew Potter died when a ride at the county fair malfunctioned, I was supposed to call his family. I was a new reporter, and it was my job to share his story. But the day after he died, the towers fell. The country was in chaos and the newsrooms’ total focus became covering the terrorist attacks. I never called Matthew’s family. I was supposed to call his family that day. I was supposed to share his story. I never called Matthew’s family, but I never stopped feeling responsible for his story. I wrote this, fourteen years later, thinking it would help me sort through my feelings. I wasn’t expecting what happened next. First I heard from former colleagues, some of whom still work with the newspaper. Every one of them said they, too, think of Matthew every year on September 11. My former editor Scott Blanchard told me that he and photojournalist Jason Plotkin created a peer-support program to help young journalists deal with and minimize trauma both for themselves and their sources. Would I still be carrying the pain of that day, would I still see Matthew’s face every September, if I had been part of such a program? Later on the day I posted about Matthew, my sister called me, her voice shaking. A friend had shared the post with the Potter family. That evening, Matthew’s sister, Natalie, sent me a message with her phone number. For a moment, I was that new journalist again, about to enter the small room in the back without a script. I took a deep breath. I didn’t need a script. I just needed to listen. I called her. For about a half-hour we talked, sometimes both of us crying. I learned more about Matthew, about how kind he was, how he and his siblings were so close they felt like triplets. She told me that some days, all she sees when she closes her eyes is the moment that ride stopped. The moment Matthew fell backward, his head on her lap, how he looked up at her and she knew he was gone. She told me about the teddy bear waiting for her on her birthday, how Matthew had picked it out for her weeks earlier and somehow kept it a secret. She told me about Matthew’s Town at Leg Up Farm, the library at Leaders Heights Elementary and the collection of Magic Treehouse books donated in Matthew’s honor. She told me that her parents focus on the bright, focus on the good and carried them through their grief. She told me not to feel guilty. She thanked me for remembering her brother. I can’t even process that. Later that evening, Matthew’s mom, Janet, emailed me. She also thanked me for remembering her son. Again, I have no words. Natalie and Janet Potter with me at the Glatfelter Memorial LibraryAs soon as the reading was over, I sat down with Janet and Natalie. Displaying astonishing kindness, they had brought me flowers and a butterfly ornament. I gave them my books, too overwhelmed to register what I was writing inside them. We talked about Matthew, about his last moments and his first. I shared how I had dreaded calling them that day yet still feel guilty that I hadn’t. “We wouldn’t have spoken to you had you called then,” Janet assured me. And just like that, the guilt evaporated. I asked her the question that has haunted me for fourteen years. “Did you feel like the entire world was crumbling when the towers fell?” Janet smiled. “No. It all sort of made sense then, why Matthew was needed elsewhere.” I can’t wrap my mind around the strength that faith requires. I know the family worked through their grief. I know Natalie still aches, that none of their pain has ever fully gone away. But I see that focus on the good, on the brightness of the world, too. I still think of Matthew every day. But now when I do, I see a kind, loving boy just starting to become independent. I see a leader, a protector, a shepherd. I think about the young reporter I was when Matthew died. I think about the guilt I carried for not being braver. For not going into that little room before the towers were hit. For not picking up the phone. For not sharing Matthew’s story. It took me fourteen years to hear Matthew’s true story. What? I'm not crying. You're crying. Thank you, YABooksCentral.com, for reviewing A BLIND GUIDE TO STINKVILLE. Please check it out here. "One of my favorite characters was Alice’s mom. She struggles with depression throughout the book, but rather than avoid talking about her mental illness, the entire family has many discussions about depression, how it manifests, and how it isn’t a quick fix. Their mom is honest about her struggle, and in turn, both Alice and her brother James are able to be honest and open about their anger and fear as they watch their mom battle depression. This is probably one of the healthiest books I’ve ever read when it comes to families talking about their feelings with one another. It was beautiful to witness. " 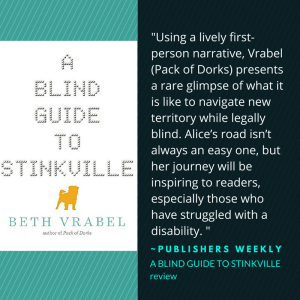 A Blind Guide to Stinkville RELEASE DAY! A Blind Guide to Stinkville, my heart on pages, is now on shelves across America. Can you believe it? I keep pinching myself! To help kick off Alice's story, I'm thrilled to share this interview with the Huffington Post. Please check it out! 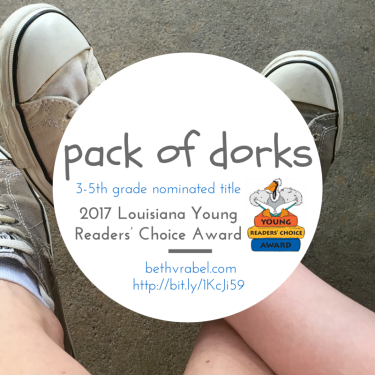 I am incredibly honored and excited to share that PACK OF DORKS has been selected as a 3-5th grade nominated title for the 2017 Louisiana Young Readers’ Choice Award. Here are some facts about the award, shared by Angela Germany, Children's and Teen Consultant State Library of Louisiana: "Nearly 28,000 students participated in the program last year. Students will read titles on the 2017 nominated list next year and vote for their favorite. The Louisiana Young Reader’s Choice program, which is in its 16th year, is a reading enrichment program of the Center for the Book, a department within the State Library of Louisiana. The purpose of the program is to foster a love of reading in the children of Louisiana by motivating them to participate in the recognition of outstanding books." Check out more about the award program here. Pack of Dorks is mentioned as a recommended book in this important post about dealing with grief and loss in middle grade fiction. I dreaded going to work that day. Not because I had any hint of the sadness, desperation and fear the day held. Because I had to make a phone call. I was so new. Only three months a graduate, two months a reporter, one month a wife. I wasn't ready for that day's assignment. When I got to work, I had to go into the little conference room in the back of the newsroom. The one that just barely fit a table and a phone. And I had to call a family in mourning. The day before, their small son died at the fair, when something went wrong with the ride he was on. His mother was beside him when it happened. I couldn’t stop thinking about it. A beautiful, sunshiny day at the fair. Did he have cotton candy beforehand? Did he pet the baby lambs and bunnies earlier? Was it quick? Everything in me knew calling the family was wrong, knew I was adding to their unimaginable pain. But then again, older reporters assured me, some families welcomed the call, found comfort in knowing their loved one’s story would be printed forever, shared with the world. I had to make the phone call, go back in that little room. I was so new, though. Over the phone, my voice sounded even younger. I didn’t know the right script for this kind of phone call. I’d wait until ten o’clock. I told myself this was so I wouldn’t wake them, but part of me knew they’d never be fully awake again. And then the tower was hit. We--all of us in the newsroom--gathered around the small television at the day editor’s desk, watching to see if it was as bad as we feared. And then, right as we watched, the second tower was hit. I never went into that room. I never made that call. The rest of the day, of the week, of the month, of the year were a blur. I was sent to train stations, bus depots, planned parenthood offices, schools, nuclear power plants, government offices, any place that could possibly trigger hate. I spoke with survivors. I made other phone calls—to victims’ families—right from my cubicle in the middle of the newsroom. I talked with a Pearl Harbor veteran and felt sick as he cried. I cried when I saw the flags flying from every house in my little city. I didn’t feel new anymore. I never made that phone call I dreaded. For months, as I tried to fall asleep next to my husband, my ears rang with the screams and sirens I had heard over and over on the television. But behind my closed eyelids, I saw only that little boy’s perfect, smiling face. I think about that family every day. I wonder if, as the towers fell, they were the only ones who didn’t gasp. If they were the only ones not shocked. Not even surprised. I wonder if they didn’t even blink as the world shuddered and changed. For them, the world aged so much so suddenly the day before. ... and they liked it! Phew!! One more month until this version of my heart is on shelves.